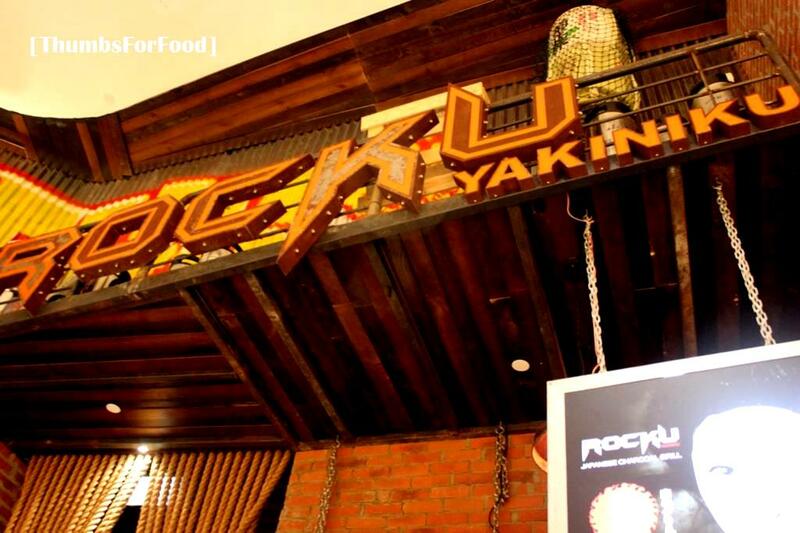 We chanced upon ROCKU one day when we were looking for a dinner place in the newly revamped, Bugis+ mall. The food ROCKU serves is Japanese Barbeque ala carte for dinner. 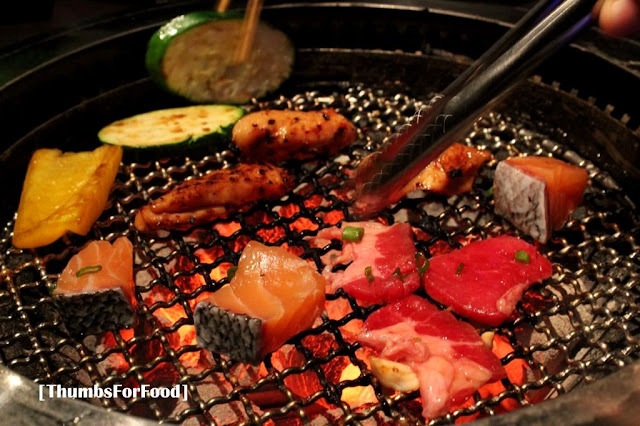 It does also have weekends lunch buffet from 11.30am-4pm at $29.90++. The exterior and interior design of the shop is like an underground punk and rock brick-walled hideout. The bricks wallpaper really brought out that vibe. The restaurant plays loud music, projecting the Music Videos of various songs, especially Japanese-pop and Korean-pop. Once in a while, you'll hear popular English pop songs. 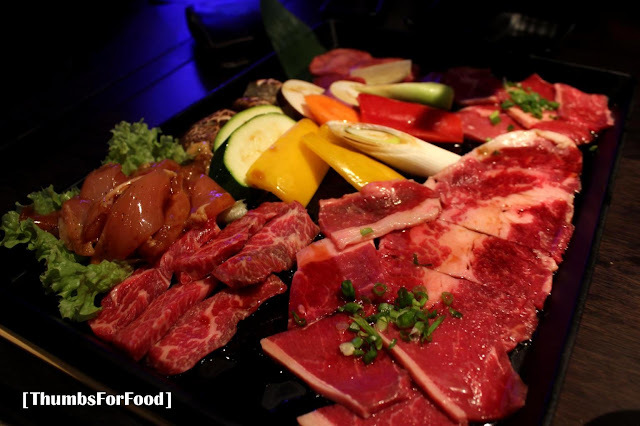 We ordered a Beef Combo Set ($45.90) which consists of 5 different parts of the beef from the more fatty areas to the leaner meats. I really don't know how to differentiate the different parts of beef the meat were from. But, one thing to be sure, the beef was fresh and well-marinated. The set even came with chicken, some vegetables, rice and even mushrooms. Their charcoal stove was preheated somewhere and brought to our table to be placed above this heat vent. I got to say the heat is really strong! 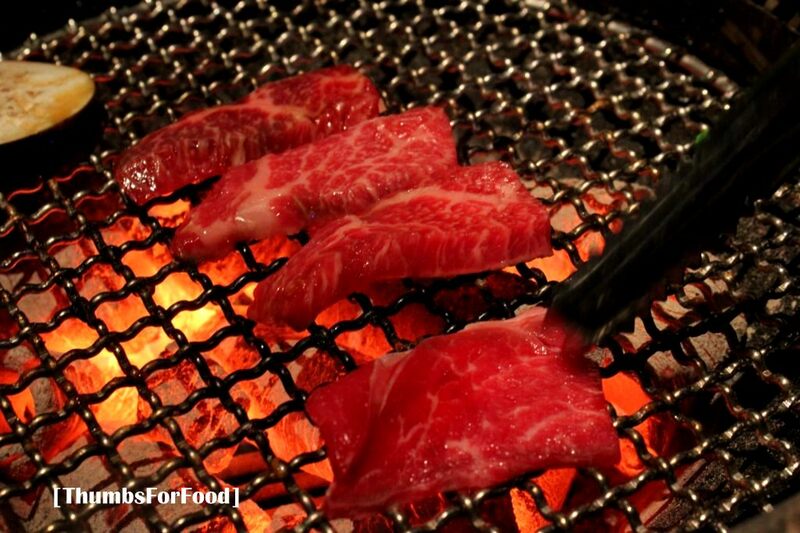 It can be good because the meat gets cooked faster. On the downside, the heat was so strong that it was difficult to barbeque. The combo sets come with 2 rice and 2 miso soups. Since there were 3 of us, we ordered an extra bowl of egg fried rice ($1.50)﻿. Since you can choose egg fried rice instead of the normal plain rice, it is recommended to try it! 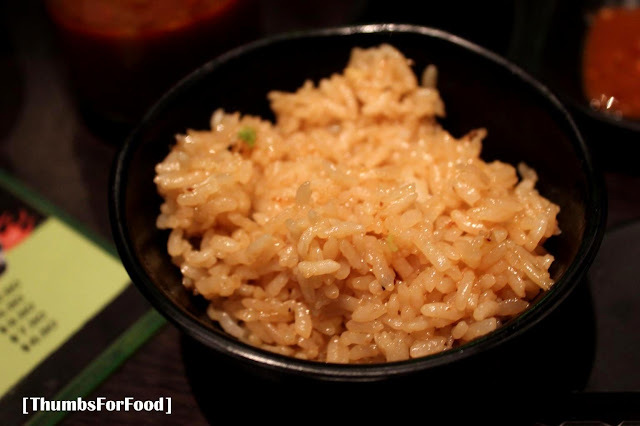 It really is different from the normal fried rice you can find else where because it uses japanese rice. Portion of rice was however small. For those people with bigger appetities, you would probably want to get another bowl. The beef we ordered was quite good. It was cut into thin slices and you can see from the fat grains that it was fresh and delicious. The marinate of the meat really made the beef yummy. 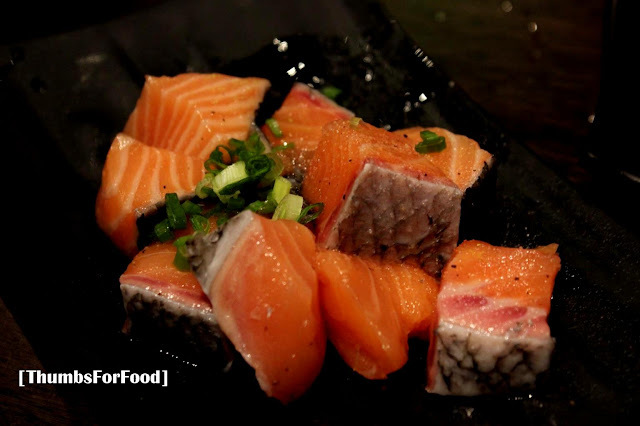 We also ordered a serving of salmon ($8.90)﻿. The portion was rather small for the price, but, the salmon was really fresh and good. Overall, the food was good and fresh. 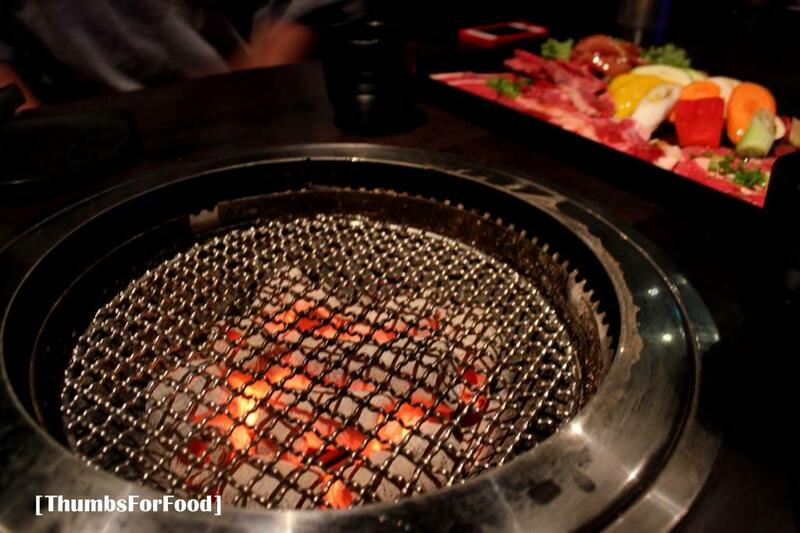 We felt that it was one of the more affordable barbeque ala carte restaurants you can find that serves quality meat. We would definitely be back. Also, it has many beer promotions in-house. Happy hour is from 12pm-7.30pm and prices starts from as low as $6 for half pint and towers are at $55 during happy hour. On Tuesdays and Wednesdays, Ladies enjoy two free alcohol beverage with purchase of food in-house, If you are dressed in ROCKU's colors, you get another 2 free drinks (for ladies only). We would be back to try it's weekend Lunch buffet at $29.90++. In a nutshell, food is decently good. 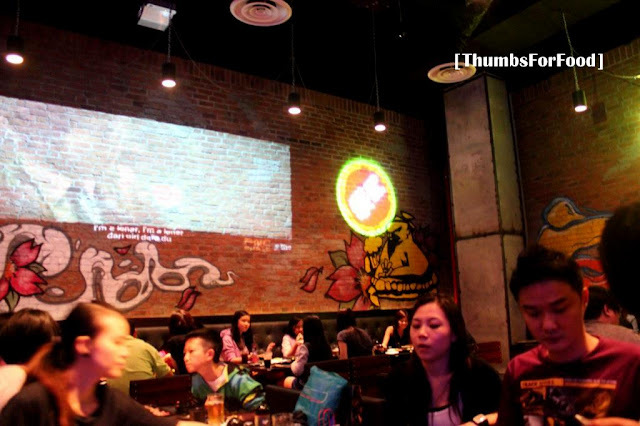 Ambience wise, I would say it's quite vibrant and noisy with loud music playing in the background and MV showing on the wall. Really not much of a romantic spot to dine in. I would think it's better for groups of friends who would want to come together for some food and drinks.